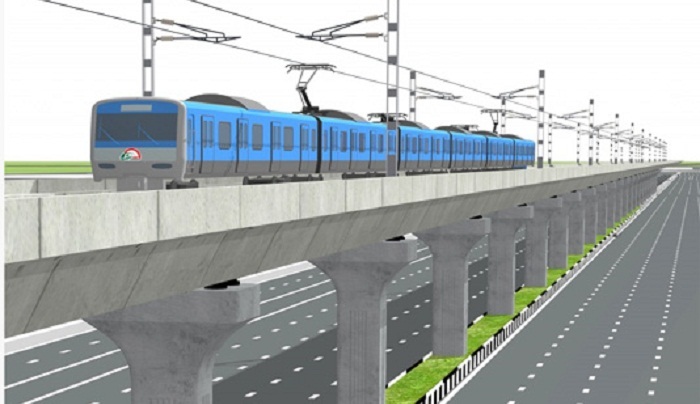 The government has sought expression of interest (EoI) for constructing 19.60 kilometer long underground and elevated metro rail aimed at connecting east and west parts of the capital city. “With all supporting documents, the EoI must be delivered, at or before 2:00 pm on 09 October 2018 for the Dhaka Mass Rapid Transit Development Project DMRTDP (Line-5: Northern Route)”, a ministry source told on Thursday. The source said the Request for Proposal (RFP) is expected to be issued to the short listed firms by December, 2018, as Japan International Cooperation Agency (JICA) provided loan toward the cost of DMRTDP (Line-5:Northem Route). According to the project details, the government has sought the EoI on August 7 for the underground and elevated metro rail. The MRT Line-5 would run on Hemayetpur-Baliarpur-Madhumati-Amin Bazzar-Gabtoli-Dar-Us-Salam-Mirpur-l-Mirpur-l0-Mirpur-l4-Kochukhet-Banani-Gulshan-2-Notun Bazzar-Vatara route. The total length of the corridor would be 19.60 kilometer — 13.60 kilometer underground and 6.00 kilometer elevated. The project comprises the following components: Land Development of Depot; Civil Works of Depot; Construction of Main Line and Stations from Hemayetpur to Vatara (Elevated: 6.00 kilometer, 5 Stations; Underground: 13.6 kilometer, 9 Stations); Electrical and Mechanical Systems; and Rolling Stocks and Equipment for Depot. The short listed consultants may undertake works in association with other consultants listed or not listed in the short list as long as the Short Listed consultants execute a major portion of the required services. Apart from this, the government led by Prime Minister Sheikh Hasina has been implementing another elevated MRT Line-6 under a fast track priority initiative. Once implemented, it will run from Uttara to Motijheel with 16 stations along the way. The objective of the consulting services is to achieve the efficient and proper preparation and implementation of the project through the basic design for electrical and mechanical system and rolling stocks, main lines and stations (Underground and Elevated), tender assistance, construction supervision, institutional development, management and operational support, training of DMTCL staff, facilitation of implementation of environmental management plan, environmental monitoring plan and resettlement action plan, technology transfer, non-rail business strategy plan, security assessment and risk mitigation, surveys, utility relocation assistance and public relations activities.